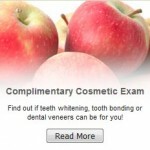 Dental Practice Promotions – display generic or custom promotions as part of your web marketing. You can choose to include two “Promo Boxes” on your website(s), each with three rotating panels. We suggest that one be used for dental market specific promotions and the other for more general promotions. Select from a large library of background images and short pre-written promotions, or you can upload your own images and write your own promotions. You also have the option to have your promotions click through to a longer, complete version of your offer, or even out to an external website. Any custom promotions you enter will also be listed in your dental directory marketing. The “Promotions” area in the “Customize Portals” section is a powerful and exciting tool. This is where you can choose the content of rotating promotional offers on your site. You don’t need to include them, but it’s a great way to make your site more visually interesting to prospective patients. There are two different promotional tracks, each appearing on different pages of your website. We recommend using Promotion Track 1 for promotions relating to that dental marketing website’s Primary Dental Market, and using Promotion Track 2 for more general promotions. Your website will automatically show a different offer every 10 seconds. Each promotional track can include up to 3 offers. If you already have 3 listed and you want to add another, you’ll have to delete one first. Click the “Suggestions” button if you’d like to select a pre-written offer. Then, once you’ve added it, you can click the pencil icon to edit it. To change the copy, click on the text you want to change in the image at left, then type your edits into the text editor. You can even change the image by clicking the “Select Background Image” button. You’ll be asked to select a 300 by 250 pixel image. We have a library of stock images for you to choose from. You can also select your own picture from “My Images.” You could even make a promotion that was just your image, and delete all text – it’s all about what you want to promote. It’s also up to you if you would like the promotion to include a button that patients can click for more information. The “Offer Details” tab is where you will enter more specific details about that offer. Once we’ve completed the promotion, we’ll want to preview it on the live website. If you have entered too much text, the offer may not display properly. If a patient clicks on the promotional offer to see more, they’re taken to your website’s “Current Specials” page. Patients sees the Headings for each of your offers, and selects which promotion interests them. They then fill out their contact information and submit the request. The request is instantly passed on to your office based on the preferences entered in the “Notifications” area of the “Appointment Management” section. Next, the patient sees the full details of the offer, prints out that page to bring with them to their appointment. The patient also gets an email confirmation of their request. Just one more note: it’s your responsibility to make sure that your offers are consistent with the laws of your state.